Right up front I should say that I know when dealing with an old car it's very tough to verify the mileage. Having said that, I have to give the seller the benefit of the doubt. If the mileage stated for this car is true, this is a pretty remarkable find. In its day the TR3 was an impressive entry level sports car. It was the first mass produced car to have front disc brakes, it had exterior door handles (many British roadsters did not) and was available with overdrive, a hard top and wire wheels. The engine, a 2.0 liter 4, could propel the car to 60 MPH in 12 seconds. The front suspension was independent with coil springs and wishbones. Given all that, it's pretty easy to see why Triumph was able to sell almost 60,000 of these cars. 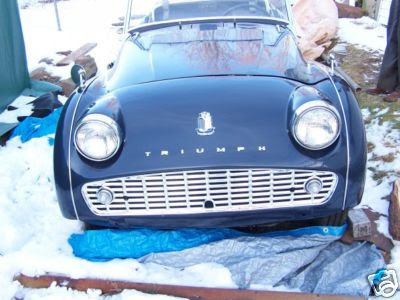 The eBay listing for the 1959, 7516 mile, Triumph TR3 is not one of the better listings I've seen. There is little description and the pictures are not great. To his credit, the seller has done some research on the car trying to verify its mileage and is not stating with absolute certainty that it's a 7500 mile car. The pictures show a complete car that appears to be in overall good condition. There is one very alarming thing in those pictures, though... The car is located in New Hampshire. It looks like it may have been stored outside. There are pictures of it with snow around it. TR3s are rust prone cars. Check this one out thoroughly if you are considering it. I don't really know what to say about this car. It's 50 years old. If the car really has 7516 miles on it (and not 107516) it's an amazing find and worth a premium price. If not, it's still appears to be a nice TR3A and may be one worth considering. Caveat emptor. Click here to see the eBay listing for this TR3. Theres something not right about that car. It looks too good to have low miles on it. It looks like it's been restored. Your friends father may have been able to pack his cigarettes without opening the door but could he light one while doing 50 with the top down? That was the challenge in an old sports car.